Ever seen Andrei Arlovski’s mouthguard that made him look like he had fangs? Well, the answer is Fight Dentist Custom Made Mouthguard. It is created with high heat with 6 atmospheres of pressure and multi-layers of PolyshoK material, offers the most precise adaptation to the hard and soft tissues of the mouth, controlled thickness in key areas providing optimal protection for our sport’s specific needs. This review was submitted by my good buddy Steve. Hope you guys enjoy! Let’s talk about the process in which guards are made. First off, you will receive a self-impression kit which contains simple, easy to follow instructions on how to take your dental impression. This process does not take too long but it is important that you follow the instructions very carefully so you get the most out of it. This is what customization is all about, as opposed to your regular boil-and-bite mouthguard. If you do opt to choose what kind of design you would like to be on your mouthguard, you would need to email them with the design along with your details. The impression kit will then be translated into your very own Fight Dentist Custom Made Mouthguard which you will recieve within the next 2-3 weeks. On the added note, Dr. Persky, the “Fight Dentist” is affiliated with Zuffa meaning that they produce mouthguards for most of the UFC, WEC and The Ultimate Fighter fighters so I was pretty damn confident about placing my order. I got my mouthguard on time as advertised and I was very impressed with the look and feel of it. When I finally put it in my mouth, as expected, it was a perfect fit; so much that I was in front of the mirror shadowboxing. That’s not all, I could breathe properly, I was speaking clearly and heck, I was even able to properly drink with it on. It had a very soft and rubbery feel which is due to, I reckon, the PolyshoK material used to create the guard. It basically covered the whole of my upper teeth and gums pretty adequately. 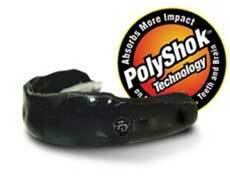 As for the PolyshoK material, well it’s a bit different from any other mouthguards I’ve used seeing as it is a bit softer but by no means does that mean that you don’t get enough protection — during hard sparring, it feels as if the force is distributed throughout the whole mouthguard rather than putting stress on anywhere else which is basically what a mouthguard is supposed to do. Overall I’m pretty damn impressed with the Fight Dentist Custom Made Mouthguard. It comes pretty pricey but you do get what you pay for. Investing on an expensive mouthguard is better than a $2000 dental bill.